Hi everyone! 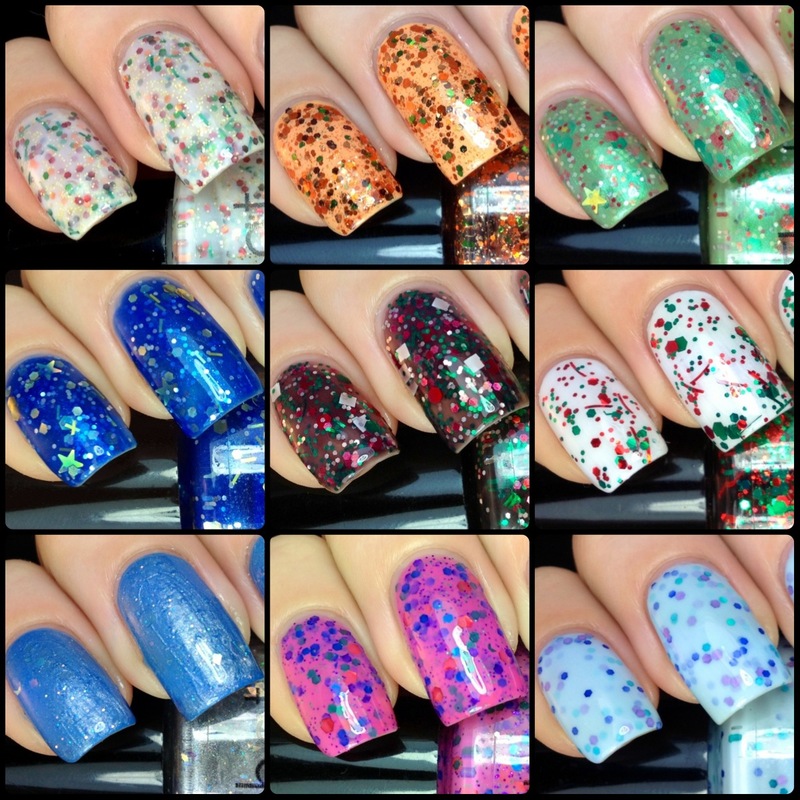 I'm so excited to show you some great polishes from All That Glitters! Eggnog Wasted is a light cream creme, loaded with gold micro hexes, green, red, brown, and copper hexes, and green bars. The formula was easy to work with, and definitely did not require any glitter fishing! Shown is two coats of Eggnog Wasted. Autumn Bomb is a clear coat loaded with micro copper glitter along with copper, green, orange, and gold hexes. This was an easy one to work with as well. It applied smoothly and the glitter was easily distributed across the nail. Shown is one coat over Nubar Orange Cream. Pinch of Grinch is a soft green shimmer loaded with gold stars, silver micro hexes, soft green mini hexes, and red and green medium hexes. The formula was easy to work with, but was a bit on the sheer side. Shown is three coats of Pinch of Grinch. Lights in the Night is a medium blue shimmer loaded with gold stars, gold bars, and multi-sized silver and gold hexes. This was another smooth formula. I did have to do a little fishing for the stars, but that's always to be expected with larger glitters. Shown is three coats of Lights in the Night. What the Elf? is a black jelly loaded with white squares, green bars, and red, green, and silver multi-sized hexes. This had a smooth formula, and the glitter seemed to really latch onto the brush for great coverage. Shown is three coats of What the Elf?. Spotty Dottie Holiday is a clear coat loaded with red and green bars and multi-sized hexes. The formula was very smooth and easy to apply. Some of the bars did want to stick together though. Shown is one coat of Spotty Dottie Holiday over OPI My Boyfriend Scales Walls. Killer Icicle is a soft silver shimmer loaded with multi-sized iridescent hexes, squares, and shreds. The formula for this was a bit on the sheer side, so I opted for layering it. Also, the shimmer seemed to often overpower the iridescent glitters. Shown is one coat of Killer Icicle over Nicole by OPI I Sea You and Raise You. Goody Goody Gumdrops is a medium pink creme loaded with purple and green micro glitters, along with blue, red, purple, and green hexes. The formula was very easy to work with and applied really smoothly. Shown is two coats of Goody Goody Gumdrops. Cool Yule is a soft blue cream loaded with light purple, teal, and blue hexes. This one was also very easy to apply. I absolutely love the look of this one! I think it might be my favorite. Shown is three coats of Cool Yule. I had a lot of fun trying out all of these fun polishes, and I hope you enjoyed them too! You can find All That Glitters polishes at their store here, and be sure to check them out on Facebook to see all of their updates! Aren't they awesome?!? One of my favorite indie brands :)) great swatches! Autumn Bomb & Cool Yule are gorgeousss!! These are beautiful - not a single one I don't like! The first one looks like trapeze from china glaze!! !